Forty-four percent. That's the alarming unemployment rate for those aged 15 to 25 in Italy, where I traveled recently to meet with other global chief executives and business leaders. The reason for Italy's high youth unemployment? Tortuous red tape, high taxation and thuggish unions. Many of the CEOs at the event I attended noted that Italy is mired in unionization. This has created a restrictive jobs market that crowds out well-educated, aspirational young people, many of whom are forced to flee their homes and seek work elsewhere. But "elsewhere" within the European Union is currently not much of an improvement. Even in Germany, the EU's most reliable economy, train and airline unionists have gone on strike, bringing the country to a near-standstill. Incredibly, both Italy and France--where the youth unemployment rate stands at 24 percent--want the EU to foot the bill for their joblessness woes. Global investors' patience has been stretched thin as European Central Bank (ECB) President Mario Draghi and German Chancellor Angela Merkel continue to bicker over how to resolve the region's slowdown. As I told CNBC Asia's Bernie Lo, the EU's default policy is to tax anything that moves. Led by pro-taxation economists such as France's Thomas Piketty, Europe's policies have become a sort of contagion resonating throughout the rest of the world. The eurozone countries have an imbalanced approach to jumpstarting their economies, relying only on monetary policy but failing to address fiscal issues such as punitive taxation and over-bloated entitlement spending. You can see how disastrous the results have been: France and Germany's industrial production has turned down recently. Their purchasing managers' index (PMI) numbers are below the 50-mark line, indicating contraction. This trend is especially worrisome because Europe is a bigger trading partner with China than the U.S. is. The EU would do well to look east, specifically to China. Last week senior Chinese officials met in Beijing to resolve the sorts of problems the EU can't seem to fix, let alone acknowledge. On the chopping block were regulations--hundreds of them. According to Premier Li Keqiang, 416 lines of red tape have allegedly either been abolished or eased in order to facilitate business growth in important sectors such as transportation, logistics and telecommunications. In June, Li vowed to slash an additional 200 measures. The Chinese government also plans to relax oversight of key areas such as utilities and natural resources, land and the pricing mechanism of money. Gone is the government's control over shale gas, coal bed methane and imported liquefied natural gas (LNG). The mining sector's tax code has been reformed. And for the first time, private companies have been granted the license to ship crude oil. It appears as if China is starting to see the light. They're introducing competition back into their capital markets instead of strangling it, as the eurozone has done. Between January and September, 10.97 million new jobs were created in China, exceeding the government's goal of 10 million in 2014 and beating the benchmark by an entire quarter, according to China's National Bureau of Statistics (NBS). 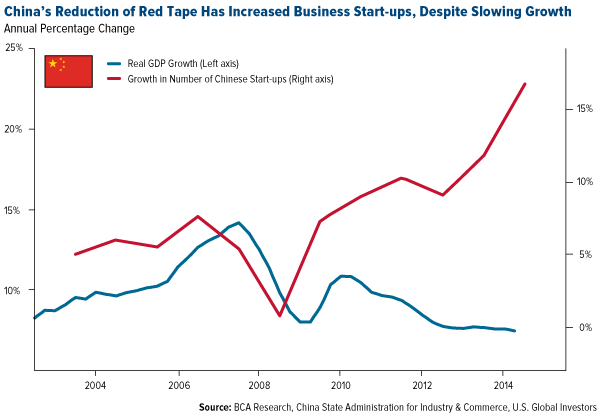 As you can see below, new business start-ups in China have skyrocketed. These red tape-cutting measures, coupled with fiscal stimulus, are needed now more than ever. As promising as Premier Li's promises are, China still faces deflation and declining real GDP growth. The Asian country's economy is currently headed for its slowest expansion since 1990, the main culprit of which is the struggling real estate market. Other problems also continue to hold China back, many of them deeply-rooted and systemic. The Ease of Doing Business Index ranks China 158 out of 189 economies in the "Starting a Business" category and an almost-dead-last 185 in the "Dealing with Construction Permits" category. According to the World Economic Forum's most recent Global Competitiveness Report, the two most problematic factors for conducting business in China are access to financing and corruption, another issue Chinese officials are addressing this week. These issues can't and won't be fixed overnight. But unlike the EU, China acknowledges them and is seeking innovative solutions. One of the only benefits to having a one-party system, as China does, is that you can't shuffle off a set of problems to another party and then lay the blame at their feet when they go unresolved. You must think long-term. 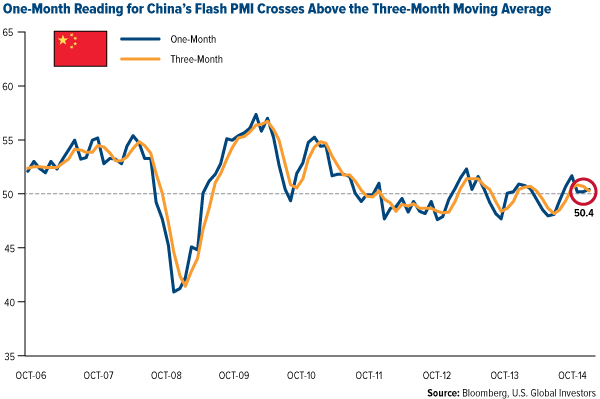 Last week we were relieved to learn that China's flash PMI came in at 50.4. Anything over 50 indicates growth in the manufacturing sector, but as I've discussed on numerous occasions, what really matters is that the one-month reading crosses above the three-month moving average. Such a "cross-above" historically means that commodities and commodity stocks perform better in the coming months. Based on our research, three months following a cross-above, there's a 73 percent chance that the S&P 500 Index will rise more than 2.4 percent and a 55 percent chance that the S&P 1500 Energy Index will rise more than 0.7 percent. As you can see, this crossover did indeed occur, the first time it's done so since May. Of course, flash PMIs are merely preliminary, and we won't know the final results until later. But for now this is certainly positive news. One of the reasons why Chinese manufacturing is picking up steam might be the recent collapse in commodity prices. Low commodity prices undeniably hurt certain stocks in the space, and we've felt the pain in some of our funds. 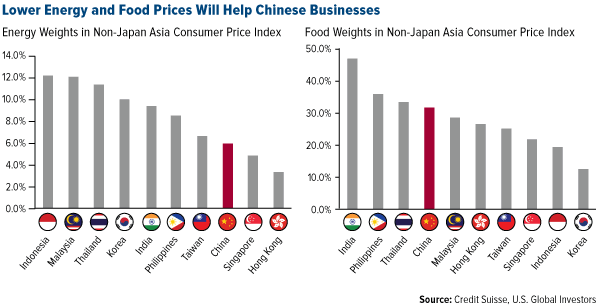 The silver-lining, though, is that these low prices have helped non-Japan Asian companies get ahead, a tailwind for our China Region Fund (USCOX). 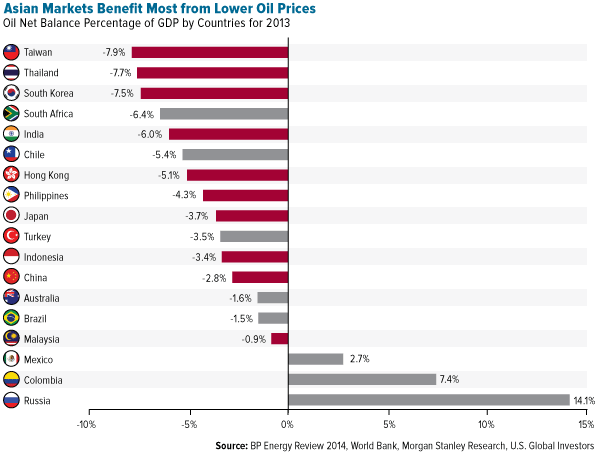 Because labor continues to be relatively cheap in Asia, commodities tend to be the single-largest company expenditure. Lower steel and aluminum costs benefit machinery, automobile and equipment manufacturers, as well as homebuilders, shipbuilders and oil and drilling equipment suppliers; falling corn and wheat prices are welcomed by food and beverage producers; cheap copper is good for construction and engineering, utilities and electrical equipment. Then there's oil and gas. Since June, Brent crude has corrected itself over 25 percent. Again, this is a headwind for petroleum companies and large net-oil-exporting nations such as Russia and Mexico, but cheap energy equates to huge savings for emerging Asian countries. One final bellwether of economic growth I want to touch upon is accelerated electricity generation and usage. 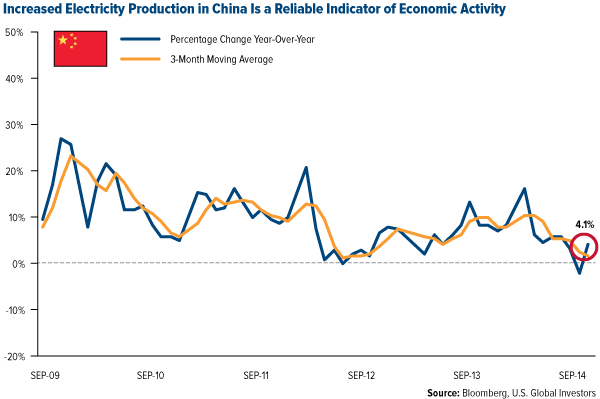 In the past, Chinese Premier Li Keqiang has cited this as one of the more reliable indicators of economic activity because electricity is not easily stored and the data is difficult to manipulate. This month, energy production improved 4.1 percent year-over-year--not a huge cause for celebration, but a step in the right direction nonetheless. Compared to many eurozone nations, China is relatively young. Whereas the median age in Italy is 43 years, in China it's 35. There's huge growth potential in this region, especially now that Premier Li has resolved to cut red tape and balance monetary and fiscal policy. In 10 years' time, the 35-to-45 cohort, a well-educated group with good salaries and credit, will expand dramatically. Consider this: of the 1.35 billion Chinese citizens, about 618 million, nearly half, have access to the Internet. Of those, 302 million, nearly half again, shop online. These numbers will continue to grow, and with them, greater investment opportunity. Name one Western European company that, in recent years, has achieved the sort of success Alibaba, Tencent or Baidu has. Not in a Piketty economy.